Fake Colours is a 3D, cube rolling, puzzle game in which the player must move three coloured blocks to their corresponding target squares. Game Blocks are able to roll on top of each other, but are unable to roll onto tiles that are not their respective color. These puzzles become more difficult as the game progresses and later can include mini-coloured cubes that change the original cube’s colour once it moves through the mini-cube. Although simple to learn, Fake Colours because one of the most memorable puzzle games since Tetris. With ambient music and well made graphics, Fake Colours is addicting and fun to play as well! So test yourself and give it a try! Fake Colours is a gorgeous, fun, and challenging puzzle game that is easy enough for any to learn but extremely difficult to master. Fake Colours contains 30 levels, and its 3-level demo has been a huge success on the site GameJolt. Forthright Entertainment's C.E.O Ryan Waller talked about the benefit of launching on OUYA. "The OUYA console is the perfect platform to launch Fake Colours on. OUYA has been flying under the radar with steady growth, and OUYA's 'OUYA Everywhere' campaign brings even more potential customers to our game. Unlike the Apple and Google Play app stores, the OUYA is not flooded with hundreds of the same game reskinned with different game art, giving us easier visibility." Fake Colours is available exclusively on the OUYA and will be coming to other systems later this year. Fake Colours is a 3D, cube rolling, puzzle game in which the player must move three coloured blocks to their corresponding target squares.Blocks are able to roll on top of each other, but are unable to roll onto tiles that are not their respective color. 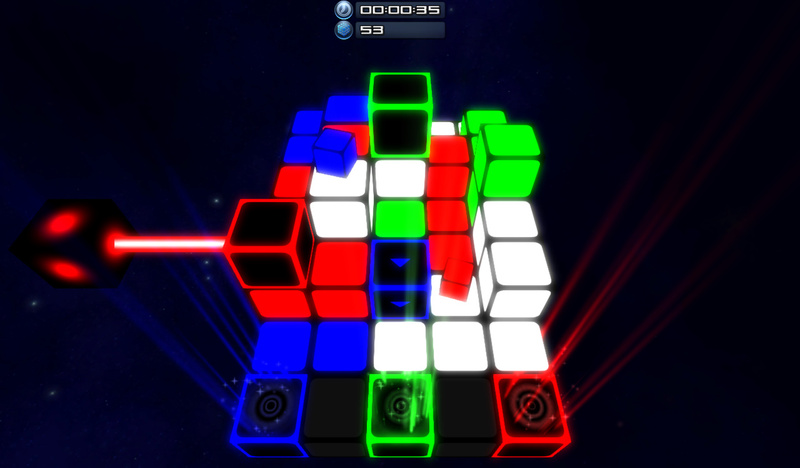 These puzzles become more difficult as the game progresses and sometimes includeS mini-coloured cubes that change the original cube’s colour once its touched. Although this is quite a simple game, the ambient music and well-made graphics help make it addicting and fun to play, as well as providing hours of replay. RT @WycombeFanApp: @forthrightenter Thanks for following us! The app is now live on iOS at Spont.ly & Android at T.co !